Monday through Friday from 7:15 a.m. to 5:30 p.m. Drop-off and pick-up times vary with families' schedules. For school-age children, there is afterschool care as well as full day care during school vacation weeks, some school holidays, and summer break. Enrollment forms are available from the Director and must be completed and signed before a child can attend. NOTE: All children must have an immunization record and physical signed by a health care professional and these must be updated annually. When enrolling your child at Sandwich Children’s Center, you will enroll him or her in a program for the year. He or she will stay in that program all year unless staff, administration and parents agree that move-up is appropriate. Generally, move-up will take place in September to coincide with the public school year. Payment Due in Advance: Families will receive a tuition statement on or about the first of the month. Payment is due in advance and is required weekly on the first day that your child attends each week. SCC reserves the right to refuse care until any account due over 30 days is paid in full. Any account due over 30 days may be billed a late fee of 1.5% monthly. Payment is due on or before the first day of the week a child attends and for days the Center is open. 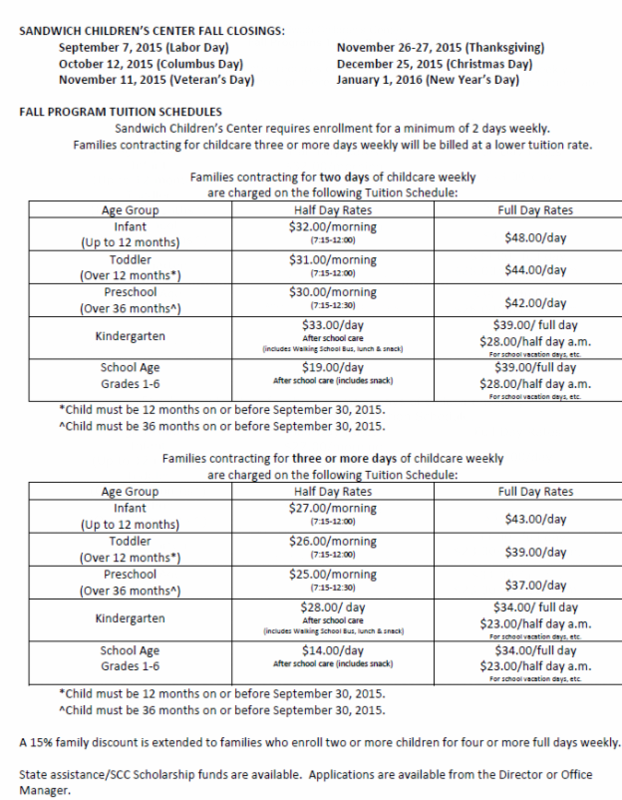 Tuition is expected for scheduled time even if a child is absent. Scholarships may be available; see bottom of page. Family Discounts: A discount is offered to families paying the full tuition rate when enrolling two or more children, four full days per week (A full day is 7 hours). The full rate will be charged for the youngest child and a 15% discount will be applied on the tuition of the older child. Non-Contractual Rate: Families requesting short-term care for children who are not enrolled/contracted at SCC (i.e. school vacation weeks) will be accepted on the basis of classroom availability and will be charged non-contractual rates $5.00 above the standard enrollment fees per full day and/or $3.00 above the standard enrollment fees per half day. Full payment is due on the first day the child attends SCC. Permanent Schedule Changes and Terminations: A two-week written notice is required to withdraw from any program or to permanently change your child’s schedule. Schedule changes must be made in writing and approved through the office. Schedule changes will depend on classroom availability. A new contract will need to be filled out and signed. The Center is closed on the following holidays: New Year’s Day, Memorial Day, Independence Day, Labor Day, Columbus Day, Thanksgiving Day and the Friday after Thanksgiving, and Christmas Day. During Sandwich Central School’s Christmas/Holiday recess, the Sandwich Children’s Center is open reduced hours: 8:00 a.m. to 4:30 p.m daily, except for Christmas Eve and New Year’s Eve when we close at 1:00 p.m. The Center does not charge tuition on days we are closed in observance of holidays. In the event of bad weather, please call (603) 284-7014 for updates and information regarding delayed opening and/or closing of Sandwich Children’s Center. The Center is enrolled in the WMUR (channel 9) Automated Storm Closing System. Closings and/or delayed openings for the Sandwich Children’s Center will appear on that station at the bottom of the television screen, listed in alphabetical order. This information will also be listed on their website (www.wmur.com). Closings and/or delayed openings at the Center will also be broadcast on radio station WLNH 98.3FM / 1530AM. Every effort will be made to have this information available by 6:30 a.m. on the day of the storm. If you will be keeping your child home due to bad weather, please leave a message on the Center’s answering machine. In the event of a power outage, the Center may open later in the day or close early due to lack of heat, hot water and plumbing. Approximately 22% of children who attend the Center receive some form of financial assistance. Scholarships are available through New Hampshire State Scholarship Assistance. For information, contact the Department of Health and Human Services directly in Conway at (603) 447-3841 or (800) 552-4628. In addition, tuition assistance may be available through the Quimby Fund for Sandwich residents and through the Moultonborough Warrant Article Fund for Moultonborough residents. Applications for tuition assistance through these funds are available from the Sandwich Children's Center director.